At last I zeroed in on a perfect Cold Porcelain recipe ! I decided to make roses , my favourite flower of all seasons. It was easy as the porcelain dough was flexible and pliable. I had kept it aside for a few hours while I located thin wire , colors and a leaf from my garden. Actually special tools are available for the purpose and one can also use the cookie cutters imaginatively. For example , a leaf shaped cutter can certainly make life easy! Take the aluminium thin wire and cut it into several 5-6 inch pieces for the rose stems , hook one end of all the pieces. Cover the wire with floral green tape. Mix in the red and green color as required in a small quantity of dough .Later I experimented and found that acrylic colors were better. Put away the rest of the prepared dough in a plastic bag for further use. There are many methods for making roses but I made tiny balls of red dough and rubbed a little cold cream -Ponds on my hands so that the dough did not stick . I started by making the centre bud and covered the hooked end of the wire. The next two balls were used for forming petals encircling the bud. The other balls of dough were slightly larger and I made the outer petals more broad and tried to curve them naturally.This is where the special tools come in ! 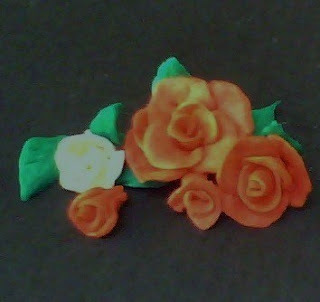 Similarly I made white roses and a few buds.Each petal can be glued on to the other. Small buds can be made with the remaining dough. Make small balls with the green dough. A real leaf or a plastic leaf would do as a template as the shape and the veins on it would give an authentic leaf without the tools. A real rose leaf can used successfully ! Smear the leaf with a little vaseline/ cold cream and carefully spread a green ball on it. Remove the excess dough, let it set for some time and remove the prepared leaf with care. Keep it on a piece of crinkled aluminium foil to dry. After making roses hang them upside down to air -dry for two days. Varnish for preservation.